We in England will lose our publicly funded, publicly provided and publicly accountable healthcare system — unless we fight for it. Andrew Lansley’s Health and Social Care Bill will fundamentally undermine the founding principles of the NHS by turning the NHS into a regulated competitive external market system, leading to increasing NHS commercialisation and privatisation. The public provision of healthcare will increasingly be replaced by private sector providers. This process will be driven by Clinical Commissioning Groups, which will buy in private sector commissioning support to help manage the new healthcare market. This process will be catalysed by the £20 billion of efficiency savings required of the NHS by 2014-15. This will lead to increasing waiting lists, service failures and rationing of care, driving a new market for private healthcare insurance, top ups and co-payments.Struggling Foundation Trusts will need to treat increasing numbers of private patients to stay afloat. Hence the importance of the recently announced rise of the private income cap to 49 per cent: NHS Hospitals in England will be allowed to use almost half their beds and theatre time for private patients. This new market will lead to a more expensive, fragmented, and inequitable healthcare service. An increasingly commercialised and financially based system will erode medical professionalism and the social contract, thus fundamentally undermining the trust in the doctor-patient relationship that is so crucial to good clinical care. The bill is fundamentally flawed and is based on a philosophy of unfettered faith in market ideology, rather than evidence. The NHS has recently been shown to be a highly performing system by the Commonwealth Fund, and received its highest ever public satisfaction ratings in the recent British Social Attitudes survey. There is no democratic mandate for such a major top-down reorganisation, yet much of the reform is being implemented before the legislation has even been enacted. This is causing chaos on the frontline as PCT staff are being sacked and organisational memory is lost. It is also extremely costly, with estimates of the cost of the reorganisation now estimated at up to £4billion by the LSE’s Professor Patrick Dunleavey. It is therefore of no surprise that there has been a major backlash from the health professions, with the BMA, Royal College of Nursing and the Royal College of Midwives, now all publicly opposing the bill and calling for it to be withdrawn. However, despite the widespread opposition from NHS stakeholders, the bill continues on its journey towards Royal Ascent, aided by the Parliamentary maths of a coalition Government, which gives it a majority in both Chambers. "it will last a long as there are folk left with the faith to fight for it"
This famous phrase is the motto of the NHS Consultants’ Association and as co-chairman of this organisation, I felt it was my duty to try and live up to it in order to defend the NHS from this bill. I therefore decided to try and raise professional and public awareness of the dangers of the bill by running 160 miles in 6 days, from Aneurin Bevan’s statue in Cardiff City Centre to the Department of Health in London in a symbolic protest. So on a damp Tuesday morning on the 10th of January this year, I set out from Bevan’s statue in Cardiff with my colleague Dr David Wilson (a fellow Consultant clinical oncologist from Middlesbrough) with 3 mock postcards from Bevan, to personally deliver to David Cameron’s constituency office in Witney, Andrew Lansley at the Department at Health, and finally to Number 10 Downing Street. We ran 30 miles on the first day to finish on the English side of the old Severn Bridge. We were joined by Stefan Coghlan, Chairman of BMA Wales for the first 13 miles. He has only intended to run 6 miles, but he pushed on to make it all the way to Newport station, where he borrowed £20 of me to get the train back. Day 2 saw us run on to Tetbury (25 miles). This is when I developed left knee pain and required a knee support and 600mg of ibuprofen to carry on. Day 3 took us through the Cotswolds and into Burford, at which point I developed right knee pain, requiring another knee support and more painkillers! On day 4, we stopped off in David Cameron’s constituency of Witney, where we at least managed to get some local media attention. There was a rally in the Green of the Town Centre with speakers including Professor Allyson Pollock of Queen Mary University London; Prof Ian Banks, President of the European Men’s Health Forum; Dr David Wrigley of BMA UK Council; and Dr Jacky Davis, co-chair of the NHS Consultants’ Association. 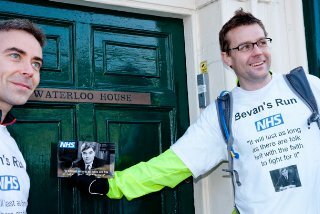 We then marched down the High Street to post “Bevan’s Postcard” at the Conservative Party constituency office. Later that day we stopped off at “Nye Bevan Close” in Oxford for another publicity opportunity and got onto Meridian News that evening. Day 5 was a grim slog from Wheatley, Oxfordshire to Beaconsfield, where we delivered a “bonus” postcard to the office of Dominic Grieve MP, Attorney General. On the final day we set off on a frosty, crisp morning towards Central London. 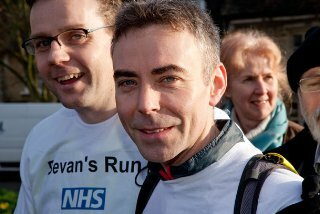 We met up with some fellow “Bevan’s Runners” on the way, and six hours later, finally turned into Parliament Street to be greeted by a few hundred supporters outside Richmond House (Department of Health). The BBC cameras were there, but we didn’t make the TV news or even the BBC News website. After some more speakers including Dr Clare Gerada, President of the Royal College of GPs, we headed off to Downing Street rattling a “Bevan’s bedpan” full of spoons to signify Bevan’s famous words about a bedpan falling in Tredegar hospital being heard to reverberate around the corridors of Whitehall. We handed our postcard in to Number 10 and then it was time for home, shattered and aching, but proud to have stood up for the principles of our fantastic NHS. I think it is fair to say that we failed to grab the national media attention we needed to raise public awareness about the threats to the NHS from the bill, but we did raise professional awareness with lots of coverage in the medical press. We are now seeing a groundswell of opposition to the bill building up from the medical and nursing professions. The Medical Royal Colleges are coming under increasing pressure to join the BMA, RCN and RCM to oppose this bill. This could prove a fatal blow Lansley’s privatisation plans. The NHS is too important for our society to lose. It is the glue that holds the social fabric together. All is not lost - we must continue the fight for the NHS.